Hello my lovelies! 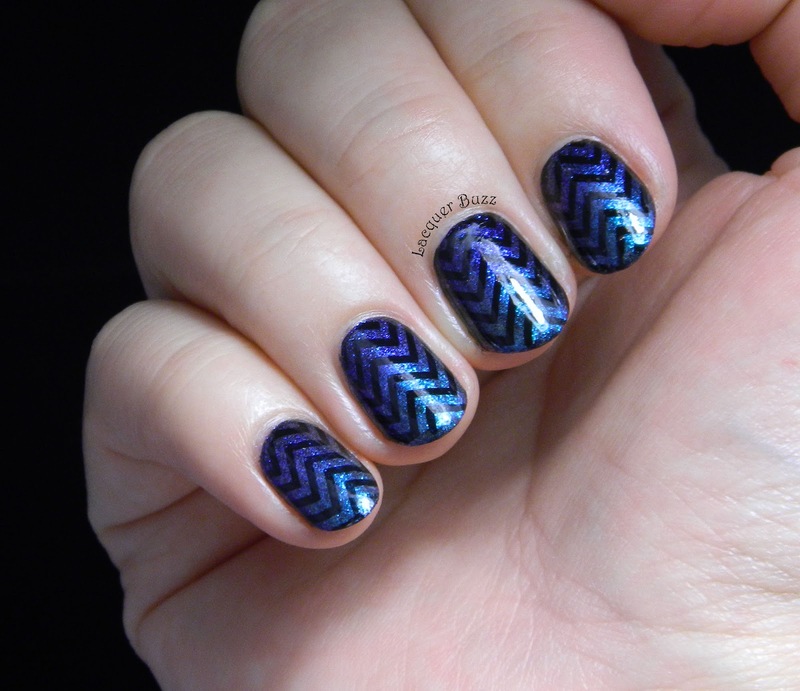 I don't know if you noticed, but lately the nail art world has been taken over by chevrons. Everybody has been doing them and there are tons of ways to achieve the look. 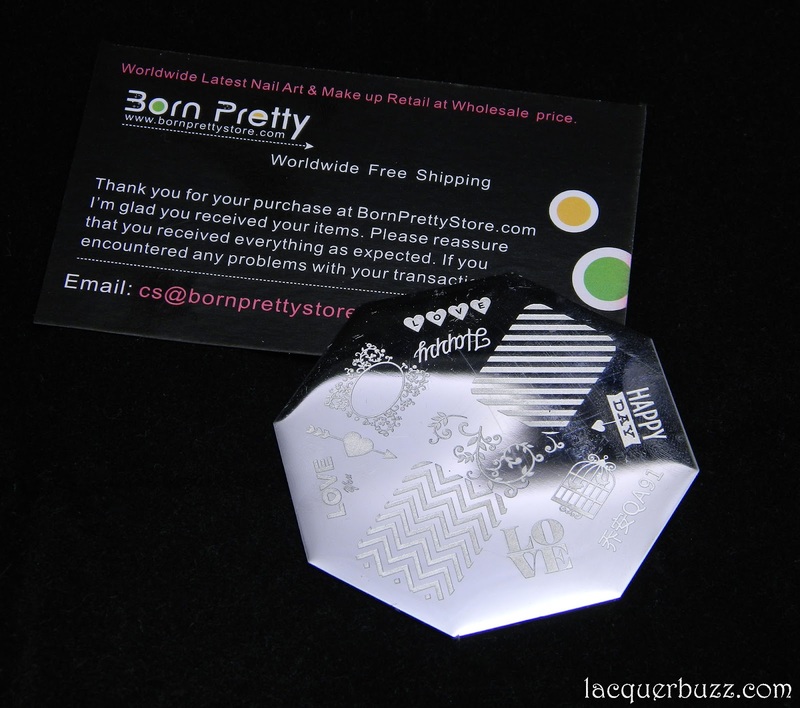 I've already shown how you can create them by using nail stencils, and in the following days I will show you two more ways to get them on your nails, all courtesy of the Born Pretty Store. If you are a fan of stamping, there is now a stamping plate with a chevron image on it. They were kind enough to send it my way and I created this manicure using it. I started with a gradient of two duochrome polishes from Flormar, namely U08 (blue/purple) and U33 (teal/blue) from the Miracle Colors line. 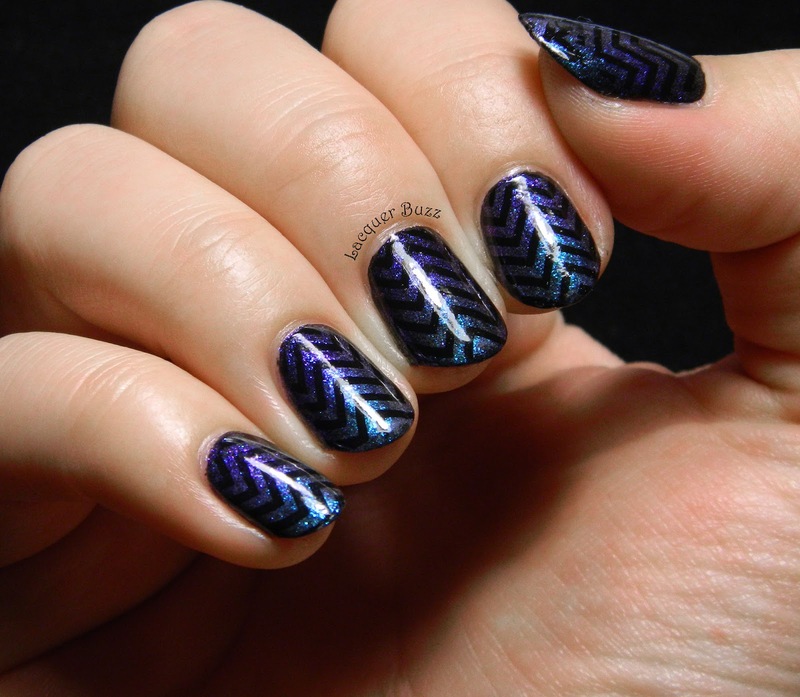 They are shimmery and blend well together, creating a gorgeous gradient effect. Unfortunately it was harder to photograph with my normal light settings so I tried something different, that's why my pictures look a little odd. 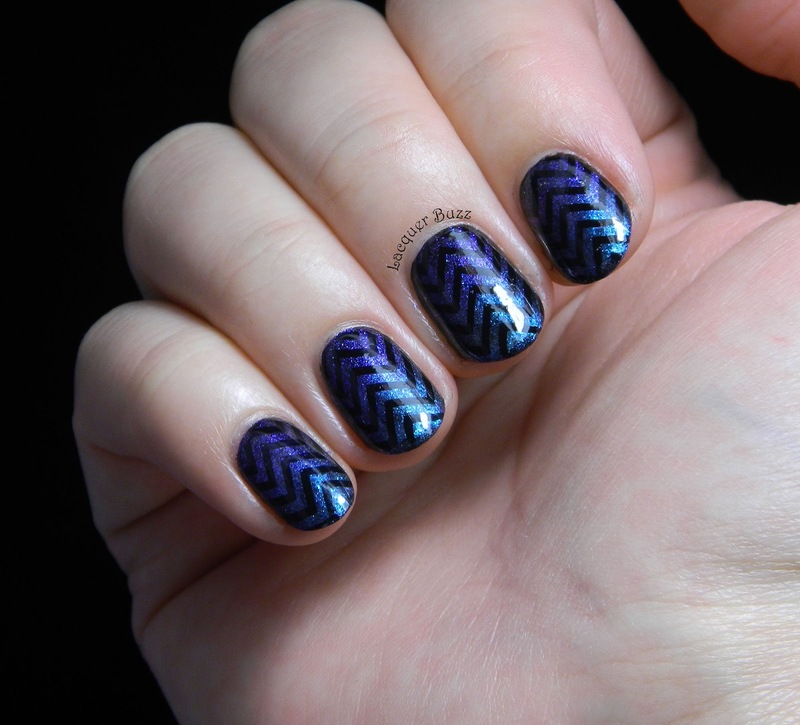 After the gradient was ready, I simply added the stamping using Konad Black and the chevron image from plate QA91. There are many wonderful images on this plate but the chevron one is the best in my opinion. You can find the plate here. Since it's a very popular plate, it may be sold out depending on when you check the website. If you don't find it in stock you can wait a bit for it to come back or check the other stamping plates they carry here. I also love the diagonal line image and I'm sure I'm gonna use that one soon too. Quality wise, this is a great plate. I didn't have any issues with the stamping and the lines are clear and perfectly etched. Here's a direct light photo of my manicure where you can see the gradient better. I really hope you enjoyed this post! Don't forget that there is another chevron post coming your way on Monday. And if you plan to make a purchase from the Born Pretty Store you can use code MFL91 to get 10% off your order. What a great stamping plate! The chevrons look great here. 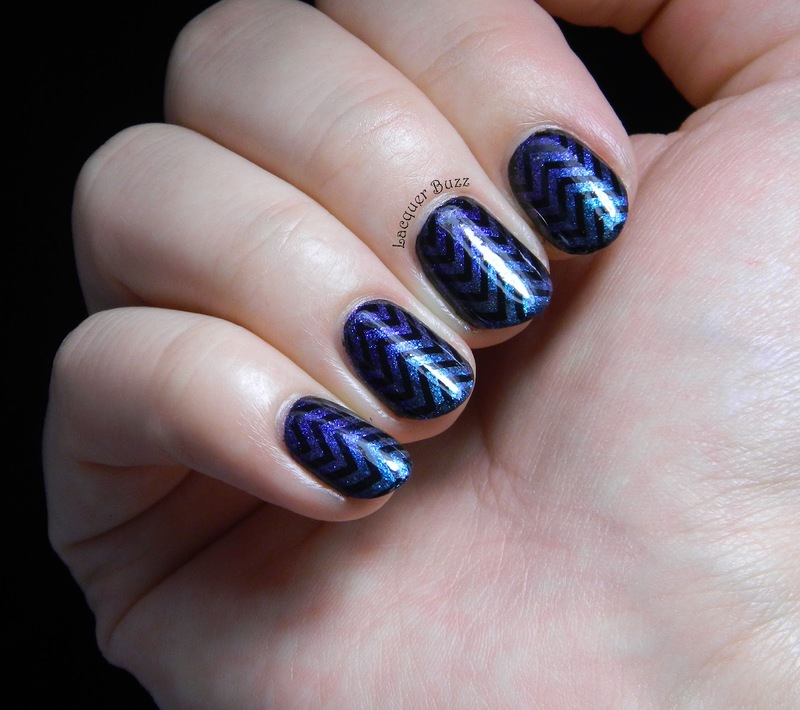 Love the chevrons stamping over the gradient. It gives it a really cool look! Multumesc foarte mult! Nici eu nu ma pot satura de chevroane si cred ca m-am aranjat cu placuta asta. Trebuie sa ma abtin sa n-o folosesc prea des.